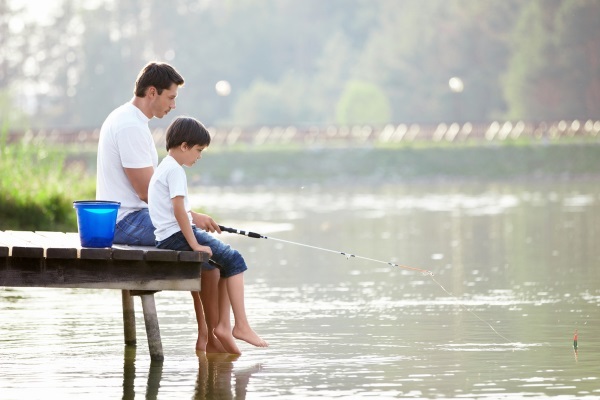 Fishing enthusiasts get a recreational fishing license for many reasons – exercise, fresh seafood for the table, relaxation, fresh air and more. Peace of mind is always cited as a main benefit, which is the cornerstone of health. Fresh fish is a great source of lean protein, and many oily-fleshed fish caught in American waters, including most tunas and Spanish mackerel, are rich in Omega-3 fatty acids that have been shown to reduce triglycerides and lower blood pressure. However, avoid excess consumption of fish species that are apex predators, such as largemouth bass in fresh water, and saltwater fish such as king mackerel, swordfish and sharks that are notorious for high levels of mercury. And, never consume fish that has spoiled due to insufficient icing, has obvious signs of disease such as skin lesions; or saltwater species that are from areas known for high levels of the toxin ciguatera, such as the largest specimens of grouper, snapper, barracuda, amberjack, and occasionally, mahi-mahi. Many forms of fishing are somewhat physical to highly physical in nature. This activity burns excess calories, and even helps to tone up overall body muscle. Long walks on the beach while surf fishing, and lengthy battles with strong gamefish are taxing, so it can be very aerobic in nature. Did you know wading in the tidal current while fishing gets the heart rate up, too? We come from the sea, and our chemistry is close to that of sea water, so it only makes sense that sea water can be beneficial in some ways to the human body. Anglers who contact salt water regularly can rest assured that salt in sea water helps remove toxins from the skin and acts as a defoliator, and replenishes skin with minerals. Sea water can also reduce inflammation and cure some skin disorders. Nothing feels quite like clean salty air in the lungs, though boaters are advised to avoid breathing fumes from diesel engines, and anglers should always avoid coastal waters or inland lakes where algae blooms or red tide is present. These events have proven to be an irritant to lungs, eyes and skin. Anglers love to claim that fishing is piscatorial therapy, and there is a lot of truth to it. In fact, the U.S. military has commissioned studies that show fishing greatly helps war veterans suffering from post-traumatic stress. If fish is indeed "brain food," then one can safely assume that fishing allows the mind an escape from daily stressors as well. Follow bag limits and all fisheries regulations – Always stay legal and know the laws governing the bag limit (number of fish allowed per person per day) and minimum and maximum, or slot size limits of the fish you plan to catch and keep for food. The limits are set by fisheries managers to preserve enough numbers of fish to spawn to keep the species stocks healthy. Practice catch-and-release whenever possible – Consider taking just enough fish for a fresh fish meal, rather than freezing away fish that may not end up being eaten. And always land your catch as quickly as possible, use barbless hooks to make the release quicker, and revive fish fully until they can swim away under their own power. Be responsible with your waste – Like any day excursion, a fishing trip produces rubbish as well. Be sure to collect and carry all trash home with you in your boat, or deposit refuse in proper trash cans back at the ramp. Designate recyclables were possible. Recycle all monofilament fishing line – Many tackle shops and boat ramp launches now have specially marked bins to deposit old fishing line. Line left in the environment can kill fish and wildlife, especially birds. Dispose of plastic bags responsibly – Plastic bags are sometimes eaten by sea turtles and six-pack rings from bundled beverages can eventually strangle marine animals and birds. Never discard them – or any other trash – in the water. Don't cast net of hook and line and catch more baitfish than you need – Filling the livewells with baitfish and letting them die unnecessarily puts a dent in the population, and remember, this is what sustains wild populations of gamefish. Be mindful of fuel pollution – Never allow gasoline or outboard motor oil to spill in waterways. Choose environmentally friendly sinkers – If possible, switch from lead sinkers to those made from steel or tungsten to reduce the chance of adding lead to the environment.